Introduction & Overview On August 18th and August 19th, Strengthen ND facilitated strategic planning sessions for the Bismarck-Mandan Young Professionals Network. The mission of the Young Professionals Network is to enhance the culture for young professionals in the Bismarck-Mandan community through professional development, entrepreneurship, community service and social networking; to create new opportunities for members; and to connect members to organizations in the Bismarck-Mandan community. Methodology In order to make the best utilization of the time allotment, a modified strategic planning approach was utilized through the following outline: ● Who Are We ● Where Are We ● Where Are We Going ● What Do We Need to Get There Included within the appendix of the report is the raw data from the planning sessions from which the report was generated. Please consider the information, including the priorities, goals, and strategies, laid out in this report as a snapshot of the organization certainly not everything could be captured. Add to it, revise it, and review it regularly to avoid this becoming a report that sits on the proverbial shelf. Goal 1 The Bismarck-Mandan Young Professionals Network will undertake and complete organizational restructuring activities by September 2020. Strategies 1. Synthesize team roles and responsibilities to three buckets (Professional Development, Service, and Social) to reflect greatest needs and requests of members. 2. Develop and communicate new team expectations, including the number of events, for general membership and team co-leads. 3. Create talking points for potential restructure justification conversations to promote widespread buy-in. 4. Hire a part-time paid employee to handle marketing and administration burdens to allow for more high-level planning capacity. Goal 2 The Bismarck-Mandan Young Professionals Network will build its capacity to provide higher quality, more-focused events and programming by September 2020. Strategies 1. Create consensus regarding the number of events to be held per month/per quarter/per year. 2. Create an annual or 6-month calendar of events for widespread distribution. 3. Provide opportunities for pre- and post-marketing and event promotion and feedback. 4. Utilize better spotlight tools to feature business partners and sponsors. 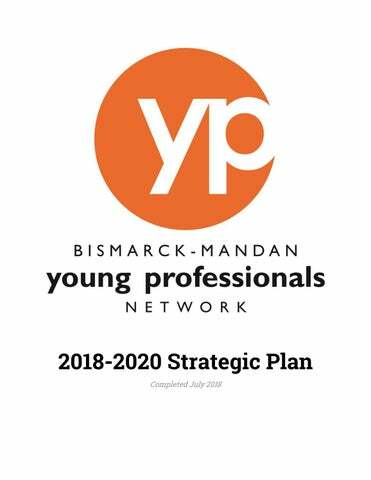 Goal 3 The Bismarck-Mandan Young Professionals Network will create a more focused and sustainable communications strategy (internal to leadership and external to membership) reflective of the new organizational structure by September 2020. Strategies 1. Revise mission and vision statements to better reflect new organizational structure. 2. Create an annual marketing plan or process. 3. Incorporate an annual budget item to allow for a consultantâ&#x20AC;&#x2122;s time to fix bugs and conduct tech maintenance. 4. Create a public file with team meeting minutes and other pertinent documents easily accessible to general membership. 5. Maintain documentation of website and other technology processes for sustainability and consistency. Goal 4 The Bismarck-Mandan Young Professionals Network will build and elevate relationships with businesses in the community that support YPN through September 2020. Strategies 1. Track attendance of members to provide back to businesses to communicate the value of the membership or sponsorship provided. 2. Provide an accountability report for business partners, including what type of events and services have been provided to members. 3. From the above-mentioned strategies, create and utilize a YPN value proposition for supportive businesses and community partners for future dues/sponsorship increases, etc. Goal 5 The Bismarck-Mandan Young Professionals Network will communicate and elevate the value of membership to new and existing members through September 2020.
scholarships through the utilization of established partners like University of Mary, Bismarck State College, and United Tribes Technical College. Goal 6 The Bismarck-Mandan Young Professionals Network will formalize and leverage the partnership with the Bismarck-Mandan Chamber of Commerce for program growth through September 2020. Strategies 1. Finalize and sign a fiscal sponsorship agreement. 2. Practice consistent communication on high-level activities by inviting Chamber staff to leadership team meetings. 3. Support a YPN/Chamber liaison position. 9 ● New member breakfast and Ambassador team ● Professional development’s business and social etiquette event ● Relationships with Wisdom Team ○ Serve as gateway to community leaders ○ Provide added legitimacy Areas to Improve ● Need to promote more family friendly events ● Communicating the value of membership ○ ROI ○ Both to new members and employers ● Professional development ○ More consistency to build attendance ● Continue to push creativity in teams ○ I.e. book clubs, balancing big events with intimate events ● Advertising & promotion ○ Sponsorships ○ Get our name out there ● Disjointed communication among the different channels, i.e. Facebook, website, newsletter, etc. ○ Lack of a central repository ○ Need to be on the verge of over-communicating with members ● Should we distill all of our events in the newsletter and media for better impact? ● Events are occurring at the same time? ● Are we doing too many events? ● Inconsistency with marketing between co-leads and marketing team with advertising events ● More interaction with Wisdom Team and general membership ○ Can we assign them back to teams? ● Target more industries ○ Labor, trade, etc. ○ Very banker, financial industry heavy ● Use creative techniques to engage new members through HR departments and associations (i.e. apartment buildings) ○ Targeted efforts to those who just moved to BisMan through Facebook ● Create a more welcoming atmosphere ○ Welcome committee/ambassadors at all events ● Additional options for payment ○ Tiered ○ Sponsored members? 10 ● Improve general communications ● More intentional efforts to bring in shy or new people ○ Leadership team members - force yourself to float from person to person at events ● Can we incorporate structured networking into events? ● Professional development ○ Make better use of community partnerships ○ I.e. Toastmasters workshop ● Marketing of events ○ Standardize the process ● More family friendly opportunities to retain older members ● Communicate with business partners ○ Strengthen liaisons WHERE ARE WE? Opportunities ● Strengthen relationships with Chamber ○ Leverage merger with BNDA ○ Promotion to potential members ○ Partner for events ● Signature events ○ Epic Impact/Chill-N-Bowl ○ Leverage to become more known, recruitment vehicles ● Demographics ○ 25-29 is the largest BisMan age group ● Variety and Access to Leaders ○ City, state, county ● Recent article about well paid millennials for dues increase ● Work with groups with similar programming ● Partnerships and relationships with businesses ● Increase engagement of existing members ○ It can be scary joining YP ○ If new member doesn’t make the most recent new member breakfast, they need to be invited to the next breakfast ● Move from 66 engaged members to 250 engaged members ● Move from prioritizing quantity over quality for events ○ Should this be limited per month? ○ How can we create demand? 2 events per month? ● Can some teams be combined? ● Multi-team event creation? 12 2. 3. 4. 5.